Dog Friendly, Fully Fenced Flat walk to Doggy Beach Offleash Area, Pool. Short walk too the Dog Friendly OFFLEASH Beach. Fenced yard for the dogs & kids. DOG FRIENDLY HOLIDAY HOUSE, fully fenced , walk to dog friendly beach. Loved having a place that welcomed the doggos. A good communal area in the house and a quiet street. The dog off-leash beach area was amazing and our girls had a blast there every day. The pool was lovely. Decent casual restaurants nearby. the home was well presented and offered a very functional floor plan. The living looks out onto the pool area so we could keep an eye on the kids and is very central to town. The owner was very helpful when we locked ourselves out and we would love to return again. We have stayed at several places in Coolum Beach but this was that bit more fun cause we could bring our fur baby with us this time. He had an absolute ball at the creek & beach. 5 minute walk to pretty much everything oh eccept the point. Probably the only thing i could have a gripe about would be the byo linen, it was just a pain packing that extra stuff. It was amazing to share our short break away with our beloved family pet! The pool and distance from the dog beach, coupled with the open living area, made for a relaxing stay. Our groodle, Ebsie, loved the place and was safe and secure, when we popped out for dinner. Although, we didn't go out much because everything for our family was here. Highly recommend. Super comfy well-appointed property! Loved it! We loved our stay at Palms; comfy, well-appointed and such a welcoming place to kick back and chill out. So close to everything important to us - the beach, dog friendly creek, amenities - perfect! We look forward to coming back! Excellent house. Great for dogs. Wooden floors in house was good especially with our dog who malts a lot. Loved sitting outside undercover in comfortable furniture and looking over garden & pool. Very quiet area. Would be great to come back. 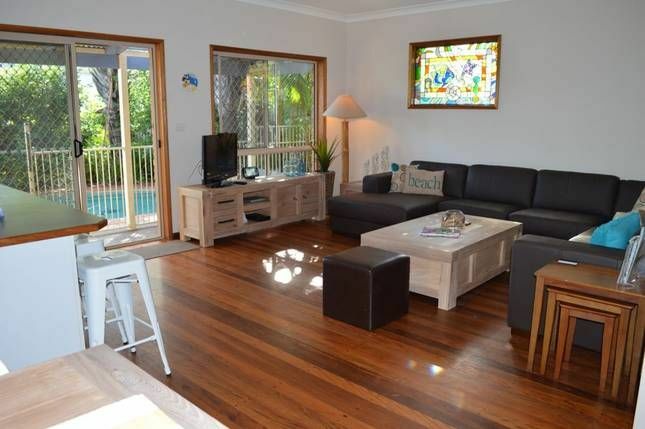 In a quiet culdesac, just a short easy (flat) walk to Dog Friendly Coolum Beach and Stumers Creek off leash area. House is fully fenced and dogs are welcome inside.